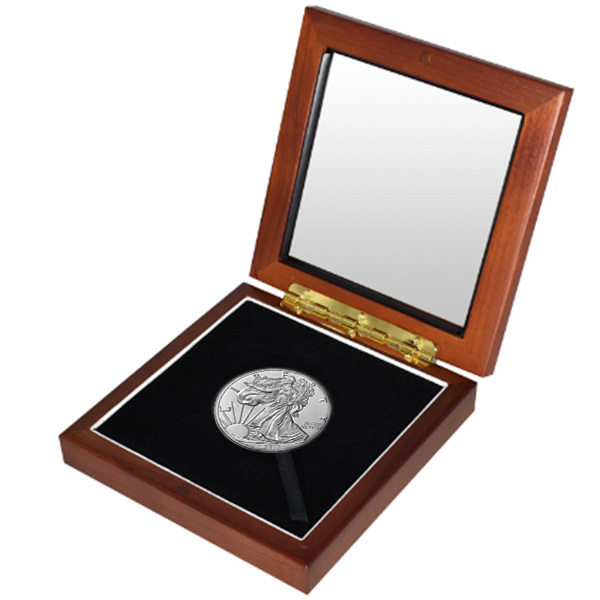 This beautiful cedar wood box features a glass top to display the stunning American Eagle silver coin resting inside. The American Eagle is widely regarded as one of the most beautiful coins ever produced by the United States Mint and is very popular among investors and those coin collecting. If you prefer a different single coin in the wood display box, just ask. Money Metals Exchange can offer many suitable coins for display and include a clear, hard plastic capsule the right size to fit these storage boxes! The wooden box is designed to hold either Guardhouse model “L” or Airtite model “H” coin capsules. With its 44.5 mm diameter nest, the box will also hold 1.75 inch military challenge medals. Box Length x Width x Height: 5" x 5" x 1.25"